Vijaya Vittala Temple is one of the important temples in Hampi. Its construction began during the time of Krishnadevaraya in 1513 CE, and it continued even during the reign of his successor Achyutaraya (1529–42 CE) and perhaps it was not completed as per the grandiose plan of its builder Krishnadevaraya. Facing east, this temple is in the centre of a quadrangle measuring 500 ft by 310 ft, and it has three gopura entrances in north, south, and east. This vast temple complex can be divided into three parts namely the outer mukhamandapa, the central rangamandapa and the interior sukhanasi and garbhagriha. The outer mukhamandapa stands on a five feet basement and has three entrances. The entire mandapa has 56 pillars of composite nature and each one appears to be an independent monument. The ceilings have lotus designs. Through the above mandapa one enters into rangamandapa, which is the most beautiful part of this temple. The pillars, the pilasters, and the niches exhibit Dravidian characters. The composite pillars of this mandapa are especially noteworthy for their decorative nature and delicate carvings of gods and goddesses and scroll work. In the centre is a grand enclosure of sixteen extremely beautiful tall pillars. At the western part of it is the doorway leading to the sukhanasi and garbhagriha. There is a pradakshinapatha, which has pierced windows (Jalandhras) to allow sufficient light and air. Inscriptions mention that Krishnadevaraya added phalapuja mandapa and kalyanamandapa to this structure. Perhaps the garbhagriha had a Vishnu image in the form of Vitthala to which deity regular worship was offered and various festivals were celebrated on a grand scale. Another important attraction of this temple is the stone chariot in front of the rangamandapa. 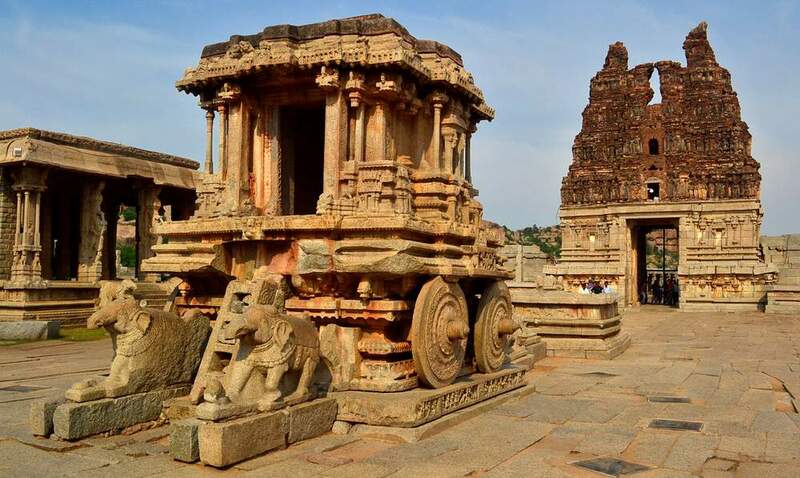 The ratha or the stone chariot looks like a miniature Dravidian temple, which originally perhaps had a brick tower. It has four wheels, two on either side and it is said that it could be turned on its axis. 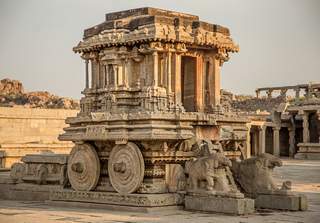 This chariot has an image of Garuda, as it is a Vishnu temple. 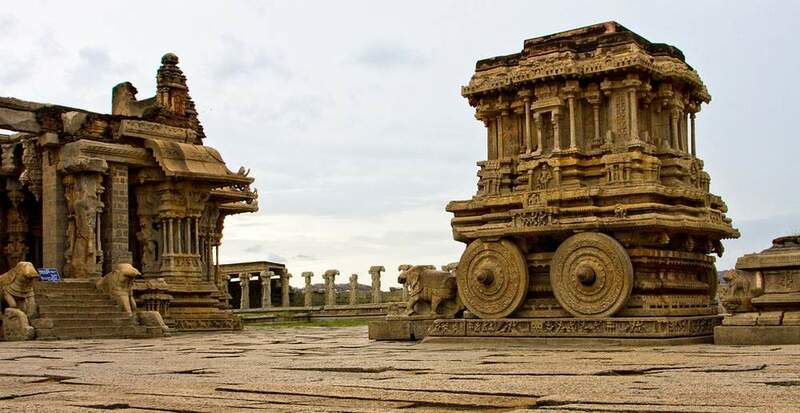 This temple is so characteristic of the Vijayanagara art, it is taken as a symbol of Vijayanagara architecture, and sculpture, as it is a harmonious blending of sculpture and architecture for which the Vijayanagara architects and sculptors were famous all over the country.